Improvement is always, yes! We could do better. How can you help? Since God has called his people to be “doers of His word”, pray to discover how He wants you to be a part of the outreach planning and information gathering. Remember, God is passionate about you! So passionate that He sent His only Son to rescue us from our own self destruction. In turn, He has called each of us to passionately seek out and save our own lost neighbors. 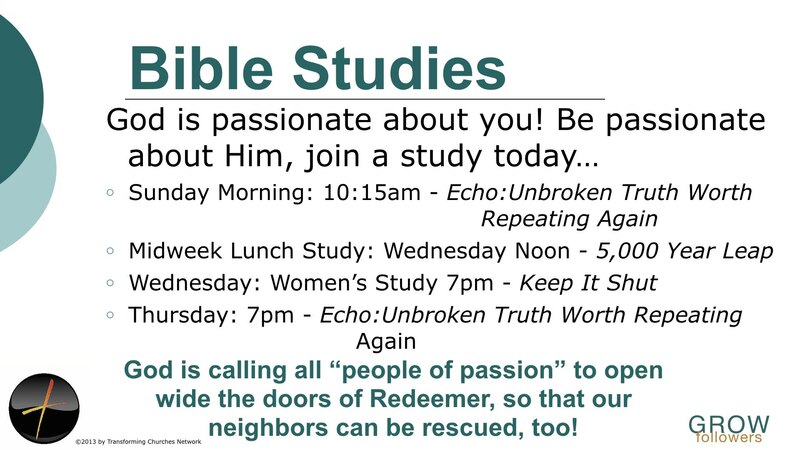 God is calling all “people of passion” to open wide the doors of Redeemer, so that our neighbors can be rescued, too! Wednesdays, 7:30pm meeting upstairs at Martin's Supermarket led by Kellee Skaggs. “Present Over Perfect” by Shauna Niequist. Leaving behind busyness and frantic living and rediscovering the person you were made to be. Present Over Perfect is a hand reaching out, pulling you free from the constant pressure to perform faster, push harder, and produce more, all while maintaining an exhausting image of perfection. Please join Pastor Mike in the Narthex as he leads a bible study on Genesis. "The Beginning". 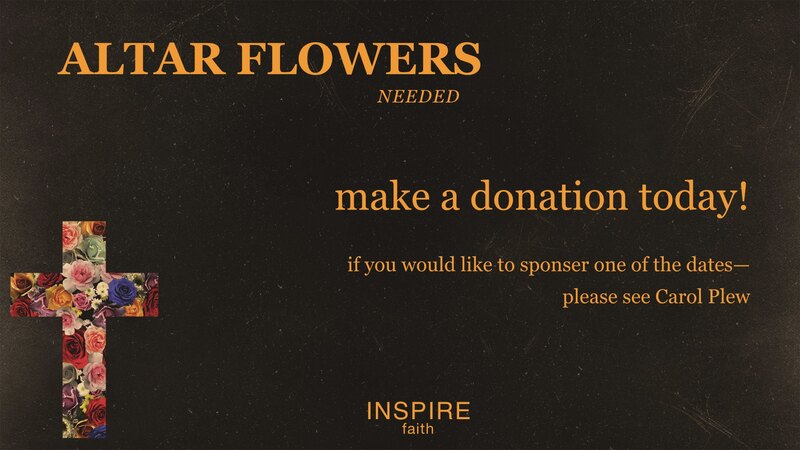 If you have a specific date(s) you would like to have altar flowers dedicated, please fill out the form in the bulletin and return to Carol Plew. Rain or Shine ~ We will begin in the Fellowship Hall then (weather permitting) head to the fenced in yard area. Raining or too cold? The “hunt” will take place in the education wing. Would you like to be a Greeter? We need you--Please contact Brent Beery or Sammy Curto for details. Thank you for volunteering. 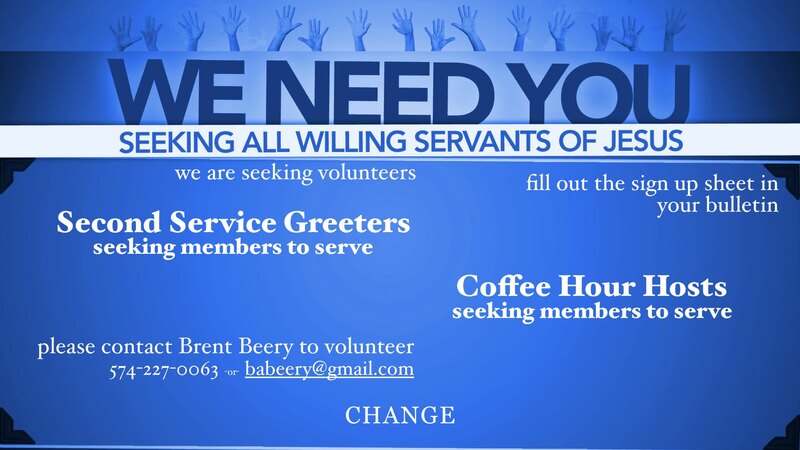 There is a need for volunteers for coffee hour. Please see Brent Beery or Sammy Curto for details. 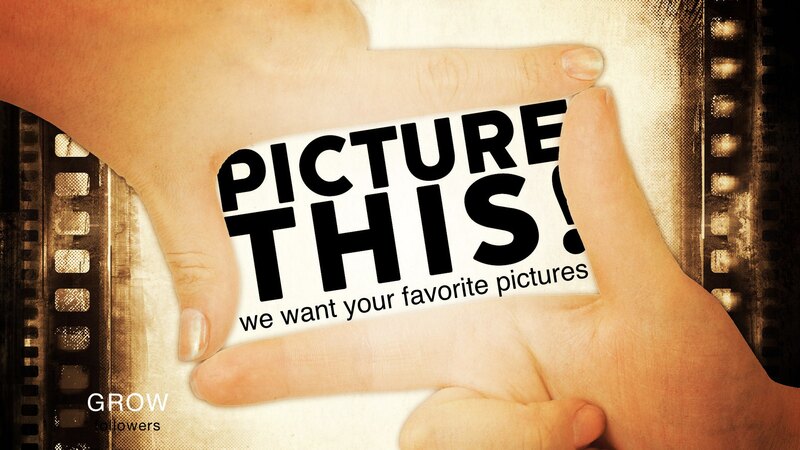 We are searching for pictures from 1995 to present day. Confirmation, baptims, picnics, etc. any church function. 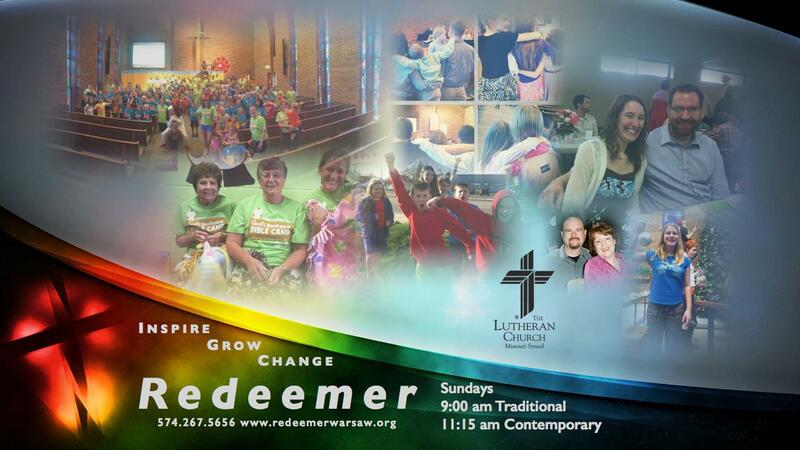 Janet Essig has been putting together a photo album of the history/events of Redeemer Lutheran Church and is asking the congregation for photos. You can either email or give them to the office. 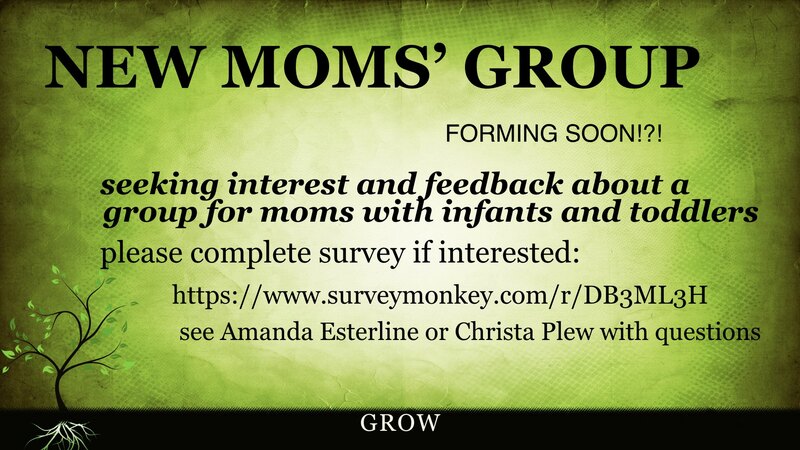 The vision for Mom's Group is to inspire and encourage one another while enjoying our time to fellowship. 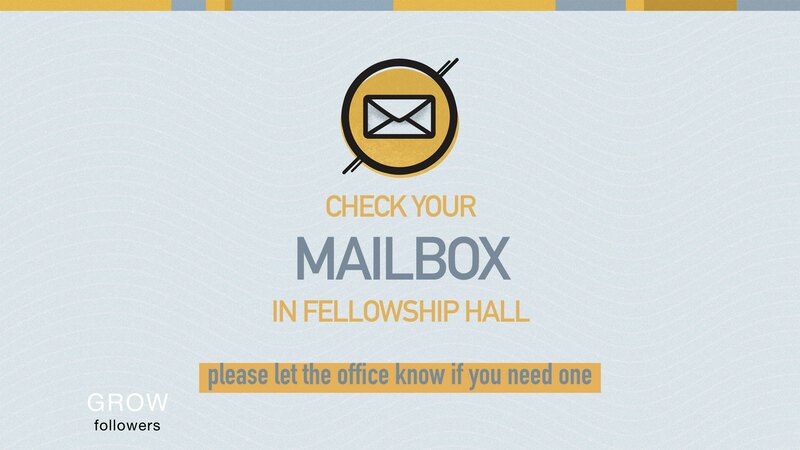 Periodicaly-please check your mail box in the Fellowship Hall. If you do not have a box, please notify Liz in the office and she will make a spot for you! Thank you. If you are interested in being on the committee--We need you! Please contact the office with any questions or to say YES! count me in. Saturday, April 27, 9am Please mark your calendars and plan on helping with a church spring clean day! We will be doing some inside & outside chores. Please see the sign up sheet on the bulletin board! Along with the newly completed roofing project, there are multiple improvements now underway in the church. We are currently accepting donations toward the funding of these projects. 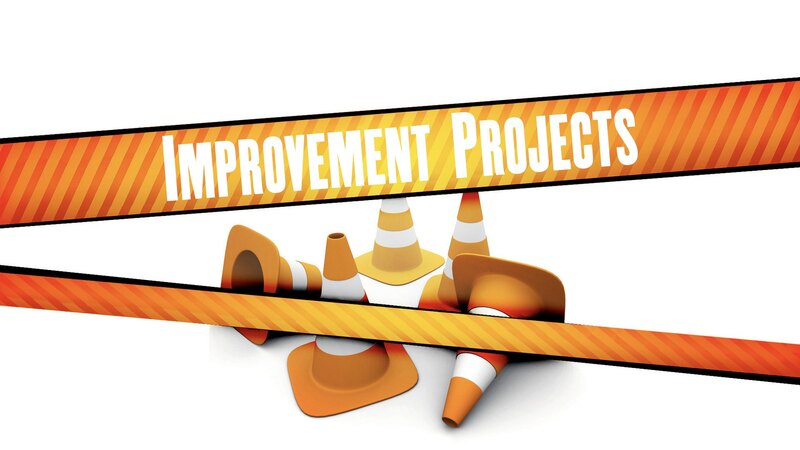 Please use the improvement fund envelopes to donate to these projects. Thank you very much for your financial support of these improvements. After 50+ years, the HVAC system that supplies the sanctuary with cool air is in need of replacement. An HVAC fund drive has begun. Amount needed is approx. $164,000.00. Amount collected to date is $73,463.81. Please pray for Jamielynn as she serves the church and people in the Dominican Republic and the missionaries around the region. Let us give thanks to God that Jamielynn is serving His children in this part of the world. 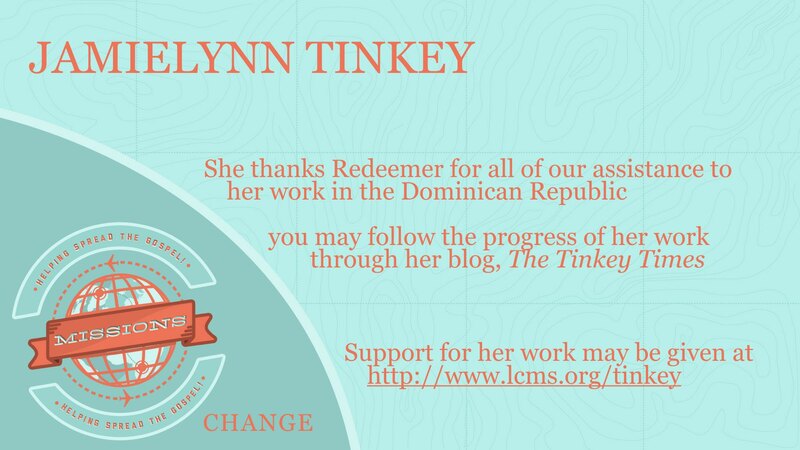 Jamielynn Tinkey serves the Lord through The Lutheran Church—Missouri Synod (LCMS) as a missionary in the Dominican Republic. In her role as a nurse, she works to support missionaries and their families serving in the Latin America and the Caribbean region as an advocate for their physical, spiritual and emotional health. She also serves the church plants in the Dominican Republic as she organizes public health education seminars, goes on visits alongside pastors and vicars and supports disability ministry activities. Jamielynn intentionally shares the Gospel through the relationships she builds in both the church and the community. Visit our Facebook page and “like” it each day to increase our web presence. 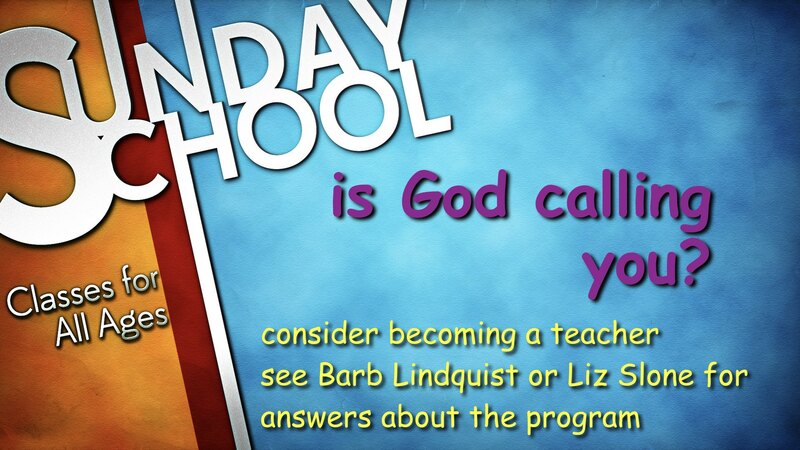 Also, those with cell phones, check in each Sunday morning as you arrive at church. Do you have extra hand tools laying around your garage? “Water for Good” a well drilling ministry in Africa has a need for used hand tools to aid in the drilling of deep water wells. 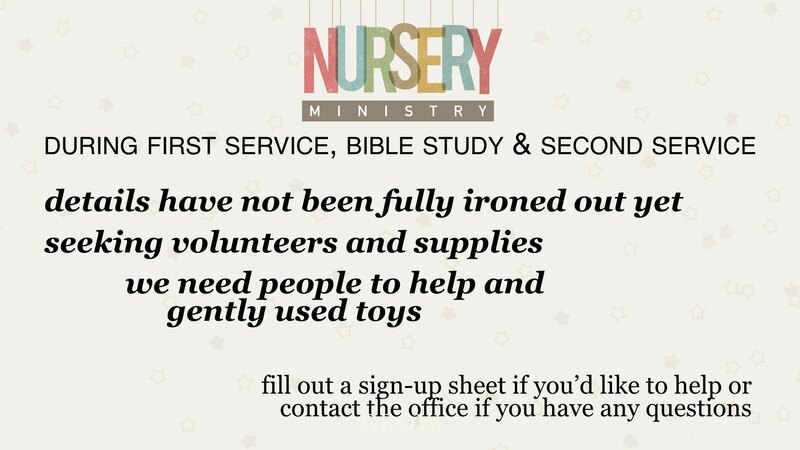 Please contact the church office if you can help with this need. Ever wanted to learn how to play piano? Do you have a child that would benefit from this type of training? Do you know of someone that is looking for an exceptionally skilled piano teacher? 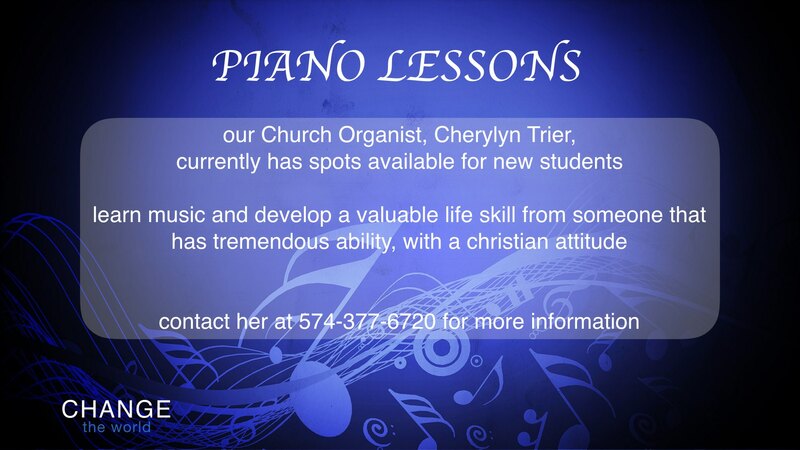 Our Church Organist, Cherylyn Trier, currently has spots available for new students. This is an excellent way to learn music and develop a valuable life skill. 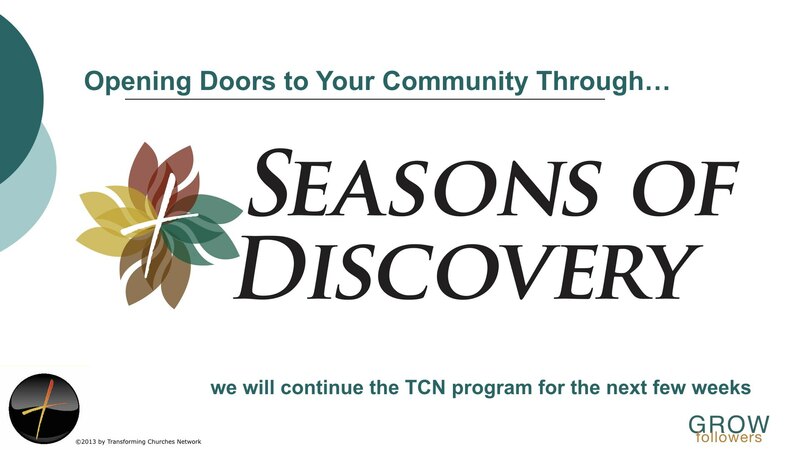 You may contact her at 574-377-6720 for more information about these classes. Garage Sale to benefit the National Youth Gathering in July. If you want to add to the sale, please bring in your items and place them at the Welcome Center. TIME: FRIDAY 8:00 A.M.-5:00 P.M.
Thursday, April 25, 6pm. Please plan to attend the 1st quarter voter’s assembly. Election of Officer & Boards will be the main topic on the agenda. Not yet a voter? No worries! Come be a part of the conversation.